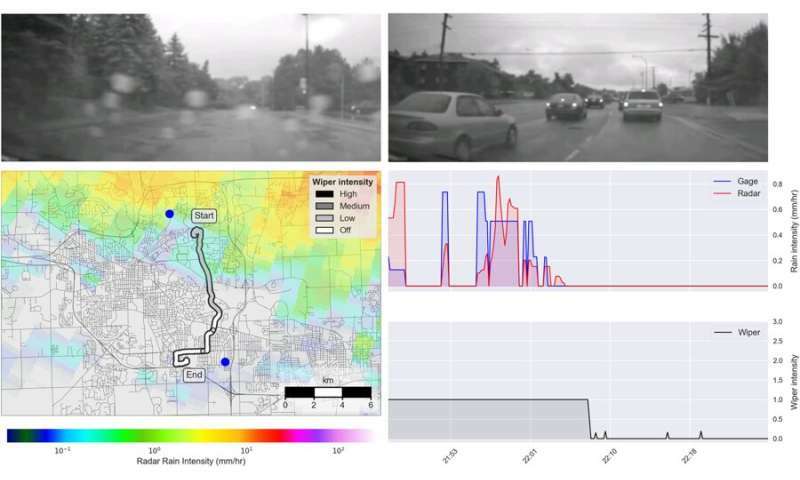 Utilizing a test fleet in the city of Ann Arbor, engineers tracked when wipers were being used and matched it with video from onboard cameras to document rainfall. They found that tracking windshield wiper activity can provide faster, more accurate rainfall data than radar and rain gauge systems we currently have in place. A community armed with that real-time data could move more quickly to prevent flash-flooding or sewage overflows, which represent a rising threat to property, infrastructure and the environment. Coupled with "smart" stormwater systems—infrastructure outfitted with autonomous sensors and valves—municipalities could potentially take in data from connected vehicles to predict and prevent flooding. "These vehicles offer us a way to get rainfall information at resolutions we'd not seen before," said Branko Kerkez, U-M assistant professor of civil and environmental engineering. "It's more precise than radar, and allows us fills gaps left by existing rain gage networks." Our best warnings for flood conditions come from the combination of radar tracking from satellites and rain gauges spread over a wide geographic area. Both have poor spatial resolution, meaning they lack the ability to capture what's happening at street-level. "Radar has a spatial resolution of a quarter of a mile and a temporal resolution of 15 minutes," said Ram Vasudevan, a U-M assistant professor of mechanical engineering. 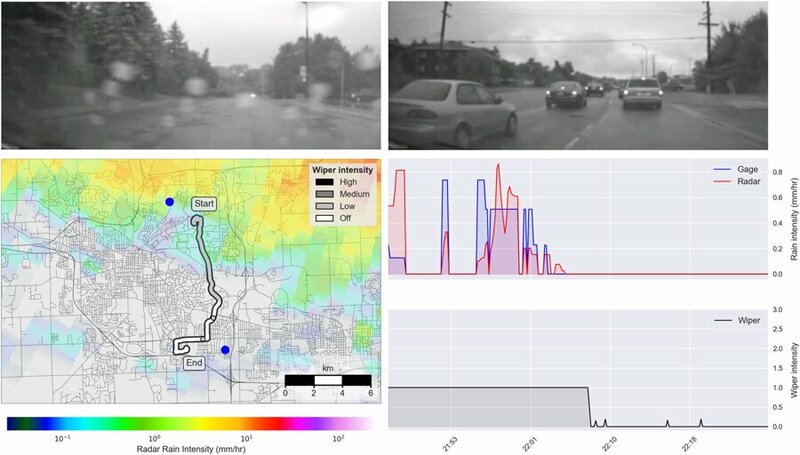 "Wipers in contrast have a spatial resolution of a few feet and a temporal resolution of a few seconds which can make a huge difference when it comes predicting flash flooding." "Because of the sparseness of radar and rain gauge data, we don't have enough information about where rain is occurring or when it's occurring to reduce the consequences of flooding," Vasudevan said. "If you have fine-grain predictions of where flooding occurs, you can control water networks efficiently and effectively to prevent all sorts of dangerous chemicals from appearing inside our water supply due to runoff." Researchers collected data from a set of 70 cars outfitted with sensors embedded in windshield wipers and dashboard cameras. The vehicles were part of a program run by the U-M Transportation Research Institute in 2014. That program, called Safety Pilot, was at the time the world's largest connected vehicle test program with roughly 3,000 participants. It continues, and is now the Ann Arbor Connected Vehicle Test Environment. "One day, when everything is connected, we're going to see the benefits of this data collection at a system scale," Kerkez said. "Right now, we've made connections between cars and water, but there will surely be more examples of data sharing between interconnected infrastructure systems." The research appears in Scientific Reports: "Windshield wipers on connected vehicles produce high-accuracy rainfall maps."